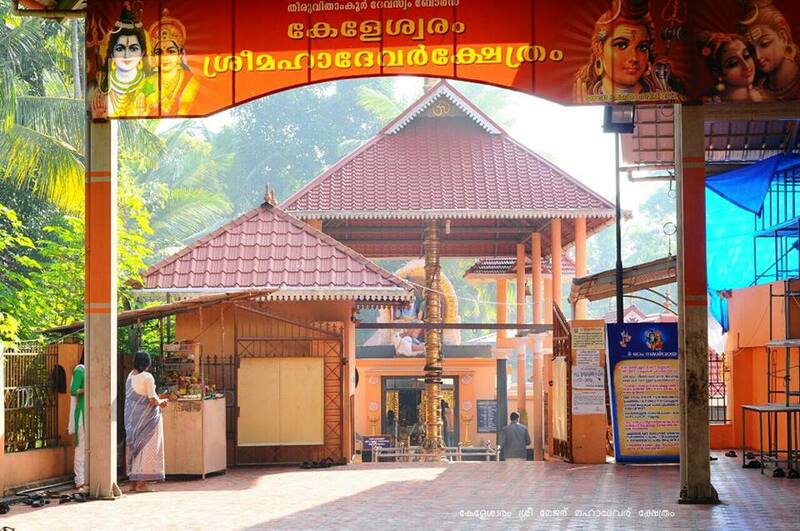 This temple is situated in Keleswaram, a village in Thiruvananthapuram district in the state of Kerala. It is located between Peringammala and Punnamoodu. The temple is located on top of a small hill and there is a climb of steps to reach the shrine. The shrine is the normally the starting point of the holy Sivalaya ottam. This is normally a run through the twelve Shiva temples. It is believed that the temple was established during the 10th century. The stone carvings available in the temple date back to the eleventh century, during the reign of Rajendra Chola I. According to records, the temple was renovated in the year 1470 A.D. This simply means that this temple of antiquity must be older than 1470 A.D.
Legend has it that the temple stands through all the four Yugas. In Kirudayugam it was known as Sreesylam, in Thirethayugam Swamy Sylam, in Dhwaparayuga Bavyasylam and in Kaliyuga Sivasylam. The temple is believed to be mentioned in Ramayana and Mahabaratha. It is believed that the king Kara Maharaja placed a Shiva Linga and was worshipping the Lord. One day a bull came to the temple to graze. Upon sunset, the bull could not find its way back home so it entered the temple. Devotees believe that upon entering the temple, it sat on the sanctum and was not able to move from there. They believe that this bull is the Nandhi found in the temple. This temple is known to be miracle based. Lord Mahadeva is represented in Linga form on a square tablet. Devotees come here in large number to offer a prayer for health reasons, salvation and peace of mind. Devotees tie bells around Nandhi in case their cattle get infected with a disease. They believe that this practice heals the disease. They also offer farm produces as nivedhana. This prayer helps increase their farm yields. This festival takes place between February and March. During this festival, the devotees get dignified by Lord Mahadeva from the sanctum. Above the Lord Linga form is a bowl (Dara Patra) that is normally filled with milk or ghee. The milk or ghee drops on the Lord. What is the significance of this kind of worship? Well, the locals believe that the worship relieves them from the problems affecting their mind. Devotees also perform a ritual called abhishek, which involves giving the Lord a few hundred Kalasas. The significance of this ritual is to prevent any obstacles the devotees may encounter during wedding proposals and also bless the devotee that they may be able to sire or give birth. The temple is part of the famed Sivalaya ottam conducted during Shivratri. It is from this temple where the run to the twelve Shiva temples starts. Devotees are advised to wear clean and traditional clothing since foreign clothes are not permitted in the temple. The Darshan timings are from 0520hrs to 1000hrs in the morning and from 1700hrs to 2000hrs in the evening.